Please find below the complete twelfth chapter of Cory Groshek‘s debut, middle grade children’s book, Breaking Away: Book One of the Rabylon Series. 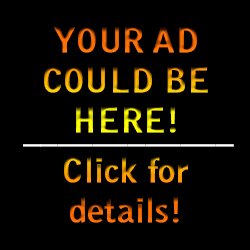 It is being provided to you free-of-charge by the author, exclusively through this site and courtesy of Manifestation Machine Books, because the author believes the information contained within the book is simply too important to be given only to those of us (parents, guardians, caretakers, and children) who can afford to pay for it. This book, which was written over the course of about 2.5 years by Groshek, encapsulates Groshek’s entire philosophy with regards to dreaming big, taking risks, trusting our gut, and choosing faith over fear in all that we do. Furthermore, the book brings together lessons about the Law of Attraction, the principles of Hermetic philosophy, and the teachings of Jesus Christ relative to abundance in a way that no other book in history has. 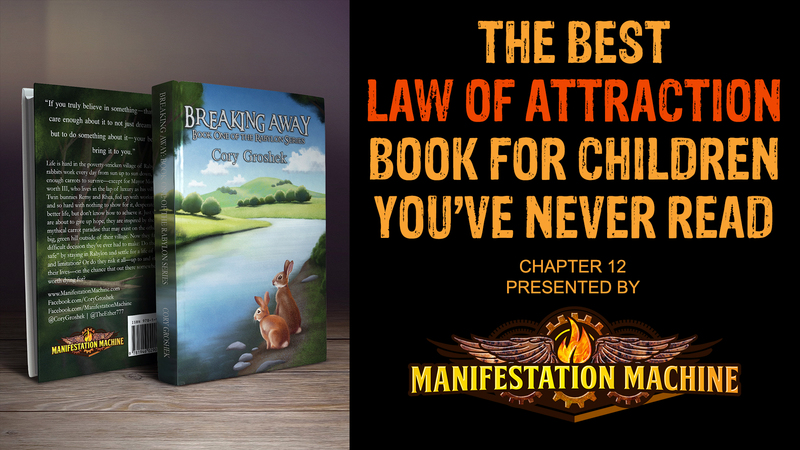 Whether we regard this book simply as a “Law of Attraction book for kids”, a self-help book for children cleverly disguised as an action-adventure, or a distinctly spiritual slant on classic storytelling (all of which are accurate descriptions), the fact remains that Breaking Away: Book One of the Rabylon Series stands as the one and only Law of Attraction book in existence today which puts the Law into language our children can understand. It is a must-read for anyone, parent or child, who dreams of someday finding their own abundance on the other side of the obstacles that stand between us and our dreams and should be required reading in every elementary school on Earth. Remy and Rhea emerged from the forest into a flat, grassy clearing. They looked around in every direction at their moonlit surroundings to see what they could see. To their right, and straight ahead, appeared to be more patches of forest, and they were about to take off running for them when something to their left caught their eye. Could it be? they thought. Could it really be? There, at the edge of the clearing, bathed in the light of a billion stars, was the big, green hill they had come so far to find! Without hesitation, they made a mad dash for it and rushed up its steep, wooded slope. Unfortunately, the hill was far steeper than they’d imagined it would be, and it quickly became apparent that running on flat ground and sprinting uphill were two entirely different things. After several minutes, their legs felt as though they were on fire and they badly needed a break. Reluctantly, they slowed themselves to a crawl and began to scope out the surrounding area for a place they could rest for a few minutes. The spot was about a third of the way up the hill and appeared to be much flatter than the areas both above and below it. With the aid of some nearby saplings, the bunnies pulled themselves to it and found themselves atop a flat, grassy ledge. Where they stood, the grass was significantly shorter than in the surrounding area, and sprouting out of it were several random patches of bright yellow dandelions. Rhea recognized the tiny flowers immediately. She and Remy had been taught at a very early age to not pick or eat them because they were poisonous, a fact reinforced by both The Great Book of Rabylon and the Mayor’s policy of collecting them and locking them away for safety’s sake. Remy bent over, plucked one of the flowers from the ground, and sniffed it. But it was too late. Remy shoved the entire plant into his mouth and chewed it just a couple times before swallowing. Rhea panicked. She couldn’t believe that she and her brother had made it this far, only for her to watch him die a slow, painful death by way of a flower! She rushed to her brother’s side, tears welling up in her eyes, and prepared to catch him, as she was quite certain that he would fall lifeless at any moment. Then, suddenly…nothing happened. And amazingly he was fine, even several minutes after having eaten the supposedly poisonous plant. Rhea stared at the flower, then at Remy’s face, and then back at the flower. After a slight hesitation, she cautiously took the flower from his paw and raised it to her lips. She looked at him again for reassurance and he nodded. And so she nibbled. Then she waited—first for a few seconds, then for a couple more. Eventually, those seconds became a minute and then, suddenly…nothing happened—again. And with that, Remy and Rhea’s entire world came crashing down. Although they’d always suspected that the Mayor wasn’t quite the “Hero” or “Savior” he’d made himself out to be, they’d never once questioned The Great Book’s teachings about what was or wasn’t safe to eat. Suddenly, they no longer knew what was true and what wasn’t, and as they came to the realization that everything they’d been taught growing up could very well have been a lie, they began to draw some even more concerning conclusions. Remy had never seen his sister so upset, and he didn’t know if she was going to cry or scream, or maybe even both. Either way, he thought he might join her. Remy went into shock. He placed his paws on the sides of his face and wandered to a nearby boulder. There, he pressed his back against the stone and slid all the way to the ground. Then he sat, staring off into space as his mind tried desperately to put back together the pieces of his now-broken belief system. Meanwhile, Rhea found herself swimming in hate: Hate for the Mayor…hate for his father and grandfather…hate for every greedy, evil thing they stood for, and for all the pain and suffering they’d brought upon her and her family. In the blink of an eye, her heart, which had once been as a levee holding in her hopes and dreams, became as a broken dam, struggling to hold back a raging river of anger that now threatened to extinguish her excitement about the other side of the hill. But then, just as she was about to be consumed by the sea of hate that surrounded her, something inside of her—which, for some reason, sounded a lot like her gut—told her to “just let it go”. Let what go? she thought—her anger? But she didn’t want to “let it go”! It felt good to hate the Mayor…to hate The Great Book…to hate everything she felt was wrong with Rabylon. And so she tried to ignore this whatever-it-was—but this only made it grow “louder” and more insistent. So then she tried to reason with it by arguing—inside her head, of course—that she needed to hate the Mayor, otherwise it would be as if she was okay with him lying to everyone. But the whatever-it-was wasn’t having any of it and again told her to “let it go”. She was just about to come up with another excuse for staying angry when, suddenly, a warm, loving feeling began to well up in her heart. For a moment, she could have sworn she was a newborn bunny again, wrapped in her mother’s loving arms—if only those arms had been long enough and strong enough to hug the entire world. Immediately, she felt the image she held in her mind of the Mayor as a greedy, evil liar melting away and being replaced by bigger, brighter, and better images: Images of row after row of bushy green carrot tops waving in the breeze…of her and Remy writing poetry and painting beside a creek….and of her family laughing, smiling, and well-fed. The images felt so real—it was almost as if she could reach out and touch them. And then she wondered…what if she could? The two were just about to take off running up the hill when the tall grass around them began to rustle and sway. They leapt backward and readied themselves to run. What now? they thought—A fox? An owl? Another wolf? Suddenly, a quite unexpected voice emanated from the grass. Slowly, the grass parted and out hobbled a very old, frail rabbit, wearing a raggedy brown vest that was so dirty, the bunnies couldn’t tell where the vest stopped and the dirt started. The old buck leaned toward Remy and Rhea as he clutched his back with one paw. “Do you little whippersnappers have any idea what time it is?” he chided. Talking seemed to take a lot out of him. He hacked and coughed as though he might keel over at any moment. The old rabbit limped in a small circle. When he wasn’t coughing and hacking, he muttered and grumbled and huffed. “With more carrots than the eye can see!” interjected Rhea. The bunnies’ puffy tails wiggled excitedly at this seemingly great news. They were so happy they could have done back flips. “But!” the old buck added, again holding up a claw, “I would hardly call it a paradise.” He resumed his limping, and the excitement drained from the bunnies’ faces. The bunnies were visibly taken aback. Rhea thought about saying something, but the old rabbit continued before she could get a word in. The bunnies’ faces scrunched up. The old buck wasn’t going to eat that terrible grass, was he? they wondered. But then he answered the question for them by shoveling the wilted brown blades into his mouth and chomping exaggeratedly. When he swallowed, his face contorted as if he’d gulped down gravel. “You want some?” the old rabbit squinted as he offered the remaining blades to the bunnies. “But thank you for offering,” Remy forced a polite smile. “Suit yourselves!” The old rabbit pushed the last bits of grass into his mouth and choked them down, “You don’t know what you’re missing!” He grimaced. “Is that all you have to eat?” asked Rhea. Remy and Rhea glanced at each other. Where the old rabbit was from was starting to sound a lot like Rabylon. “Are you sure you aren’t working too hard?” asked Rhea. The old buck cracked his knuckles, bent over and touched his toes a few times, and tried again with the stump. He squinted hard and yanked on it with all his might, but it didn’t move an inch. Then, suddenly, he howled in pain and stumbled backwards, clutching at his spine. “Ow, ow, ow!” he yelped, “My back, my back!” He gritted his teeth and winced as he fell into a seated position and scooched up against the nearest boulder. “Now you listen to me, you little know-it-alls!” the disgruntled old buck shook a finger at the bunnies. The old rabbit was stunned silent. But he was happy!—or so he’d thought…at least until these two little whippersnappers showed up! The old rabbit stared at the bunnies with cold, angry eyes, trying hard to hide his emotions. But he just couldn’t keep up the façade any longer and his eyes began to water, “I do have family,” he said with a sniff and a hint of bitterness, “or at least I did.” He stood up and pushed away from the boulder in one fluid motion, “But it doesn’t matter!” He threw up his paws, “My brother is just like the rest of them and I don’t care if I never see him again!” He crossed his arms and scowled. The bunnies’ ears perked up. Rhea didn’t wait for Jasper to respond. She rushed to him and threw her arms around his waist, and Remy followed suit. At first, Jasper found the bunnies’ embrace to be rather strange and quite uncomfortable, but then he decided that it felt good—like something he’d been missing for a long, long time. The bunnies released him and took a step back. They were beaming from ear to ear. “It’s Rabylon!” blurted Rhea. She still wasn’t over the excitement of having met the Jasper. “His name is Otis!” echoed Rhea. The bunnies glanced at each other and sighed, then looked back at Jasper, “Not good,” they said in unison. The fur between Jasper’s eyes bunched up as his nostalgia gave way to concern. “Your grass over there is more food than he’s had in a month,” said Remy. “Uh huh,” said the bunnies. “This is terrible!” Jasper began to pace again, and seemed to be talking to himself as he went on, “Here I was, thinking I’d been working the right way…the honorable way…the Rabylonian way…meanwhile, my best friend and his family are starving to death!” He plopped himself onto the ground, placed his paws on either side of his face, and stared into space. “So come with us!” said Rhea. Jasper sat silent for a moment as he pondered this suggestion. Since he’d left his brother on the other side of the hill many years earlier, he’d never once considered going back to see him. He and Casper had grown too far apart—or so he’d told himself—and there was no way to rebuild the bridge that had been burned between them. He hadn’t needed his brother, hadn’t wanted him around, and hadn’t cared if he would never see him again. But that was before these bunnies showed up. Seeing Remy and Rhea—how much they loved and cared for each other, and how well they worked together—Jasper was reminded of the bond that he and his brother had once shared, and he grew misty-eyed as he realized that he wanted that bond back. Life, it turned out, wasn’t about what he’d imagined it to be about for most of his life: It wasn’t about struggling every day to make ends meet, finding fault in others to make himself feel better, or staying angry all the time just to prove himself right. It was about happiness…it was about freedom…it was about love—it was about making as many memories as he could with the rabbits that meant the most to him, while he still had the chance. And if he was going to take that chance, he decided, it was now or never. The bunnies were so happy they shrieked. Their puffy tails quivered as they threw their arms excitedly around their new friend. And with that, the ice that had long encased Jasper’s weary, old heart began to thaw, and for the first time in a very long time, he smiled. Remy and Rhea were so full of glee that all they could do was nod. No longer did the world feel to them like the dreadful, thieving place they’d imagined it to be for so long, and no longer did it feel as though it was intent on taking what they had away from them. Now it felt like a beautiful, generous place, eager to pour only good things upon them—such as good food, great friends, and even better memories, the best of which were surely yet to come.